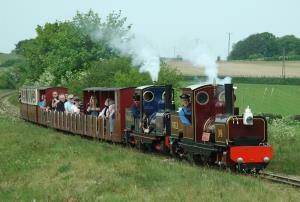 A great adventure for all the family in the delightful countryside of the north Norfolk coast. Journey time is 30 minutes in each direction. Enclosed, open and covered carriages available. Details of the train times can be found on the railway website timetable page. Adults: £7.50- £9.00, Under 16s: £5.50 - £7.00. A149 Stiffkey Road at Wells-next- the-Sea, Egmere Road at Walsingham. Coasthopper bus stop at entrance to Wells Station, frequent buses all day whilst the railway is open.